If you're after a central location, look no further! Villa Coralli is a pleasant 3 bedroom property that is ideal if you don't want to drive on your holiday. 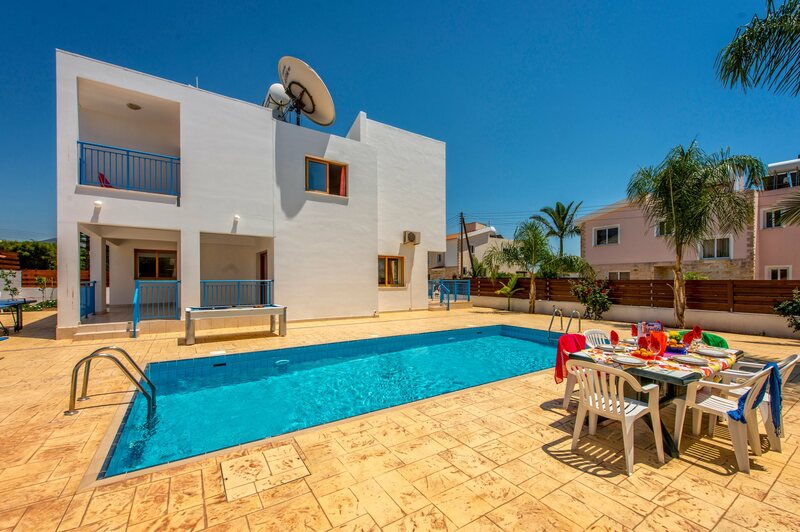 It is in a brilliant location in Coral Bay Resort within walking distance of the shops, restaurants and beach. The villa is furnished to a good standard with a large private pool and an ample outside area - perfect for a slower paced holiday . Air conditioning/heating in the bedrooms, pool heating and WiFi are included. A central location in Coral Bay coupled with a private pool and spacious outside area - the best of both worlds! The outside area is great for soaking up the Cypriot sun. There is a large pool surrounded by spacious sunbathing terrace, a dining table and chairs as well as the brick BBQ - all the much needed ingredients for a relaxing holiday. There are also 2 covered terraces which are perfect for escaping the midday sun, plus games tables for everyone to enjoy. There is off road parking for your hire car and a few steps lead up to a covered porch and entrance. As you enter the villa you step straight into the ground floor open plan living area. The lounge is spacious and has comfortable seating, a small coffee table, a flat screen TV and patio doors out to the covered terrace. To one side is the well-equipped kitchen with dining area next to it. Next to the dining area are stairs leading to a large hallway on the first floor where all 3 bedrooms - 2 twins and a double - are located . One of the twin bedrooms and the double both have en suite shower rooms, whilst the double also has access to a private balcony. The remaining twin uses the facilities of a separate bathroom and has access to the shared balcony. There is a WC on the ground floor. Villa Coralli is set in a residential cul-de-sac just off the main Strip of Coral Bay. The villa is ideally located if you don't want to drive on your holiday. Just a short stroll takes you to the restaurants, cafes and the other amenities that this lively resort has to offer. Paphos Town is 20 minutes away by bus and car. The villa's location is perfect for days out to Polis and Latchi, approximately 40 minutes' drive away. The villa is 5 minutes' walk away from several mini markets and there is a supermarket a little bit further. On the main Strip of Coral Bay, you'll find everything from designer spectacles and unique jewellery to souvenirs and trinkets. The town of Paphos is famous for its market and you can reach it by bus or car in 20 minutes. It has a market which is set in a maze of lanes selling an array of Cypriot fare including the local linen and lace. There is also a farmer's market in the old town of Paphos. The villa is less than 5 minutes' walk away from several restaurants which cater for all tastes. It's a short drive uphill to the beautiful traditional village of Peyia with its local tavernas and restaurants. A further drive will take you to Latchi which is famous for its quality fresh fish and seafood restaurants. At the end of Latchi Beach is the beautiful harbour where the old stone carob warehouses have been converted into restaurants, and you can sit and watch the old fishing boats in the harbour. The sandy beach of Coral Bay is just a short stroll away from the villa. Driving further north you will find the beach at Polis and Latchi. Ithaki Amusement Park situated in Coral Bay and with a mini-golf course, video games arcade and a cafe bar, is ideal for a family day out. Paphos Zoo is a great place for all animal lovers. There are tigers, giraffes, tortoises and many other beautiful animals to see as well as a bird show several times a day. Latchi village is 40 minutes' drive north and situated in the foothills of Akamas National Park on the North West Coast of Cyprus. You can hire boats from the harbour and explore the coastline of the Akamas which is steeped in history and famous for its white sandy beach coves and the Blue Lagoon. There are several golf courses in the Paphos area. Mario's Golf has a driving range, crazy golf and even foot golf. Alternatively, if you are looking for a 'real' round of golf, Tsada Golf Club would be another choice. Cyprus is teeming with loads of interesting historical places. In fact, the whole of Paphos is a World heritage site. With the Tomb of the Kings, the Catacombs, the Saranta Colones, the castle and the Catholithic village in Lemba being just a few of the places you can visit. You will not run out of things to see and do! Villa Coralli is not available to book for season as it is sold out. Take a look here at the Cyprus villas that are currently on sale. Paliomonastiro is located in the foothills of Peyeia in the vicinity of the ancient chapel. Set in extensive grounds with large lawned areas, and children’s play area. There is also a Taverna where you can order traditional meze, Cypriot cuisine, or just a cool drink to sit by the water features and decks. Located approximately 3¼ miles from the resort of Coral Bay on the main E701 towards Paphos, and conveniently situated along the Bus Route 615 you will find Marios Golf Park.